The streets were still under the cover of moonlight as we made our way to Delhi’s train station, passing people asleep by the side of the road, and even more people up and about starting their daily rituals. The soothing sound of the muezzin greeted us as we arrived at our destination and forced our way through the already busy crowds to reach the platform. As we stood waiting for our train, huddled together surrounding our giant backpacks, the local people watched our every movement fascinated by this band of travellers in their midst. ‘Why have they come to India? What is there to see?’ a gentleman asked our guide. We all looked at him confused as his question was translated to us. ‘Everything,’ we replied. We were warned that the trains in India sometimes lacked punctuality skills and it was possible that we could be delayed for anything up to ten hours. So, mentally prepared for a day sitting on the floor of the platform watching every train but ours come and go, we observed the people as they walked across the tracks without a second thought that they were standing in the face of death, and as they sprawled out on the floor with a piece of cloth as a bed and a bag as a pillow. I had envisioned the train ride to be an uncomfortable, claustrophobic, but exciting experience, rammed into a cage of a carriage with peoples arm pits in my face all fighting for oxygen in the sweaty hot temperatures. However, right on schedule, our train pulled up and as we stepped into our carriage we were greeted with seats, air conditioning and an included breakfast, this was not the train rides they showed on TV. A little disappointed with my luxury ride to Ajmer, I rammed my backpack into the overhead luggage compartment and took my seat. As the train pulled away from the platform the morning rituals of the local people were on display. Every three seconds we passed a man squatting by the tracks releasing his morning bowel movement, while the women washed and hung out their clothes to dry, the pigs buried their snouts into a pile of rubbish trying to scavenge some leftover food and the cows sat basking in the morning sun. It wasn’t long before the pollution and traffic jams of Delhi were a distant memory and the view from the train window was transformed into beautiful countryside, with a scattering of people spread out across the land as they worked their fields. Four hours into the journey, tired from the 3:00 alarm clock, and aching from being seated in the same position for so long, I was grateful that the train was a lot more luxurious than I expected, doing this journey with no room or air conditioning now seemed more like torture than an exciting experience. Another two and a half hours later and we finally pulled into the train station at Ajmer. After squeezing our way through yet more crowds of people we entered the car park to the sounds of horns blaring once again. Ajmer, it appeared, was a typical busy city and we were soon surrounded by women trying to sell us postcards, tuk tuk drivers trying to take us to our final destination and the midday sun soaking our skin with its searing temperatures. We hopped into a taxi, backpacks being far too big to fit into the tiny tuk tuk’s, and made our way through the streets. The higher we climbed the more peaceful the outside world became and soon we were in the mountains overlooking the city of Ajmer and on the bumpy road to Pushkar . Now, out of all the destinations on my itinerary in India, Pushkar was the one I knew least about, other than the famous annual Pushkar camel fair which takes place every November, so I was pleasantly surprised as our driver made his way to a small hotel set back in lush gardens, under the watchful eyes of a mountain. Pushkar, it appeared, was the more peaceful setting I had been craving after the hustle and bustle of Delhi. We made our way down to the famous holy lake, where it appeared to be siesta time for the dreadlocked sadhus who were guarding the holy bridge. Incense burned, filling the air with the aroma of sandalwood, as the guards of the bridge slept soundly, accompanied by their pet monkey, under the shade of a canopy. Signs were repeated everywhere along the Ghats advising not to take photos, this is after all where Hindu’s come to bathe in the holy water, as well as performing puja’s. As there was no-one bathing in the water at the time we were advised by our guide that we could take a few snaps and capture the peaceful setting that surrounded us. Leaving the holy water behind we headed up to the local market, again the sweet smell of incense engulfed the air, and after viewing some of the local stalls, selling their tie dye t-shirts and harem pants, I soon felt like I was back in Anjuna hippy market in Goa. Goa, however, doesn’t have a temple dedicated to Brahma, the Hindu God of creation, as there is only one such temple in India and that is situated in the middle of the hippy vibed streets of Pushkar. We were allowed to enter the temple, where we watched as the devotees rang the bell and were presented with Prasad, food offerings blessed by the God of the temple, and then returned to devotees. Pushkar is also home to the hilltop temple of Savitri, Brahma’s wife, and it has excellent views of the town. So, at 5:00, we climbed in the dark up the rocky steps of the mountain, with local dogs coming to guide us through the darkness. At the top of the hill a congregation of tour groups and monkeys had amassed and we sat, catching our breath, as the sun slowly greeted us with its presence. The green hills surrounding Pushkar came to life and the orange hue of the sun provided a hazy, and relaxing, atmosphere and the steep and dangerous climb in the dark was soon forgotten about. After making our way back down to the lake we were greeted by a local Brahmin priest who had offered to perform a karma cleansing ritual for us travellers, as the waters from Pushkar lake, a holy Hindu pilgrimage site, are believed to cleanse people of their past sins. 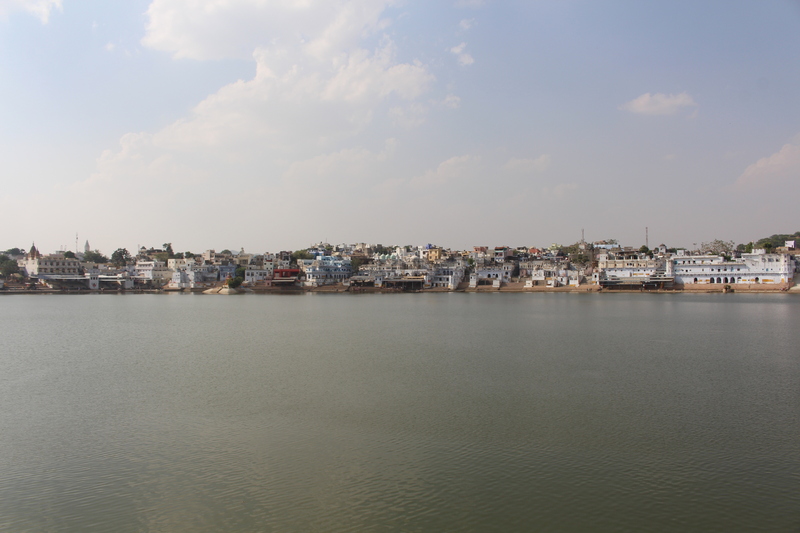 We sat on the Ghats where the priest informed us that the lake was created when Brahma placed his lotus flower on Earth and, as one of the petals landed in Pushkar, the lake was formed, hence the reason that Brahma is worshipped in this town. We were each presented with a bowl of offerings containing rice, sugar and rose petals and repeated the mantras that would cleanse the past sins of not only ourselves but our relatives, alive and dead. After presenting our offerings to the holy water the priest then provided us with a red and yellow thread to wear around our wrists to bring us luck on our journey. Peace and serenity filled the atmosphere around us as the ceremony was taking place; there was no sound of traffic, people, or animals, just our mantras blowing in the wind, being carried through the air. It was exactly what I had come to India for, to see and experience the spiritual life of the people. Pushkar, the little town I knew little about, had given me exactly what I had needed. With my karma cleansed it was time to set forth further on my journey into India and into myself. London, England’s shining star. The modern city that still manages to create romanticised images of the past as it blends the old with the new. Walking along the river bank with its restaurants, bars and shining silver buildings looming over me, I turned back and looked up at Tower Bridge. As someone who is fascinated by history I couldn’t help but hope that Apple would soon be adding a time machine feature to the iPhone so that I could go back to the old London, Elizabethan London, when the likes of Shakespeare and Marlowe were local’s and little Artful Dodgers wandered the streets to pick a pocket or two. Alas, that day may never come, so I faced modernity head on with my entourage in tow. There were ten of us in total, here in the capital to celebrate my graduation. After five years studying I was excited about finally accepting my degree, but nervous about being up on stage, all eyes on me. I am the sort of person that likes to be heard and not seen, I’ll leave the stage for the actors, thank you! 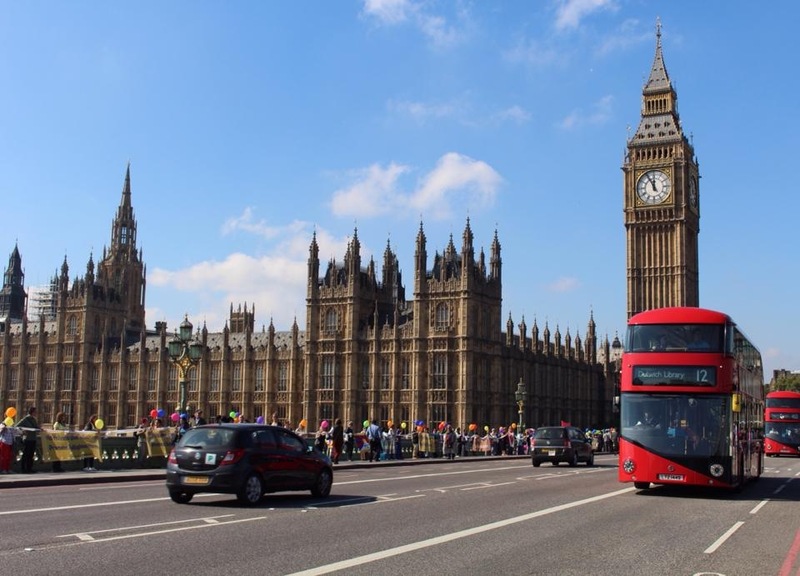 Coming to London without seeing the famous landmarks, however, would be inexcusable, no-one should go home without saying hello to our Ben at least once. So, on our last day in the city, we made our way down to South Bank to soak up the atmosphere. When the sun graces London with its presence it sure does add a touch of magic to the streets. Performers show off their talents, there are people dancing in the street and everyone seems to have a smile on their face. Well, they do before midday at least, for that is when the streets start bursting at the seams, and trying to find a space on the pavement to take a step proves difficult. There was only one thing for us to do to avoid the congestion, escape to higher ground, or a higher platform at least. Enclosed in a capsule on the London Eye, suspended in the air, the separation from the crowds below was a welcome break. Our eyes were taken on a tour through history as we followed London’s heartbeat as it zig zagged its way through the city. Afterwards we attempted to walk across Westminster Bridge, fighting against the current. It occurred to me that this bridge turns into a daily version of the Serengeti migration. As we ducked and dived through each tiny bit of space we could find the approaching wildebeest pushed us apart. Individually we made it out alive, just. Bewildered, exhausted, the three days of hectic, fast paced, city life started to take its toll. It was time to leave before admiration for the capital turned into loathing. But, just as the jungle was about to devour me and make me turn my back on London forever, I heard the calls of the Tibetan community from across the other side of the bridge. ‘Peace and compassion,’ they shouted, as they handed out stickers and stood, beaming smiles on their faces, with signs welcoming His Holiness the Dalai Lama. It was as if the universe had sent me a sign. For amidst the chaos, the noise, the traffic, and the flood of people, there right in front of me was peace, calmness, serenity. It was the perfect analogy for my current situation in life; behind me was the never ending daily grind, the busy circle of working and studying. But in front of me was freedom, the calmness of sitting in nature, the serenity of watching Buddhist monks chant and meditate. I looked across at their happy faces and smiled, with peace in my heart. It was time to say farewell to London, time to say goodbye to routine, my home, my friends and family. I am ready for the next journey, my real journey, to begin.